Sitting beside or on top of a water heater, rests a small ‘baby tank.’ Today we’re going to talk about the purpose of it. That tank is a thermal expansion tank, and today we’re going to talk about why you may want one if you don’t already have one. Some cities are now requiring them as a part of their code, and for an excellent reason: hot water expands. A temperature and pressure relief valve is not a thermal expansion device. Now that backflow preventers have become part of homes built after 2005; a thermal expansion tank might save you a fortune. I’ll explain why. From 90 degrees to 140 degrees, 40 gallons of hot water will expand by almost half a gallon. (think of a half gallon of milk to get an idea of the quantity.) It used to be that the water would back up into the water main. With a backflow preventer, this is no longer the case. In a closed system, this extra water won’t have a place to go, because water can’t be compressed. The pressure on the system increases. If the system has a thermal expansion tank, no problem; the tank takes up the extra water, and the system is safe. But, without it, that extra half gallon has to go somewhere. Sometimes it will manifest as a leaky faucet. Sometimes, though, it will cause something more sinister, such as damage to your water heater. The thermal expansion tank has a bladder inside it, which provides a place for water the flow. On the other side is pressurized air. Once a year, you can test your water expansion tank, too, with nothing more elaborate than a tire pressure testing gauge. If the pressure is zero, or if water is leaking out of the valve during the test, there is a problem. If the pressure is zero, you’ll have to add air to the tank, which you can do with a bike pump or air compressor. The PSI is written right on the tank. Just make sure you have the shower or a faucet (hot water) on when you do this. 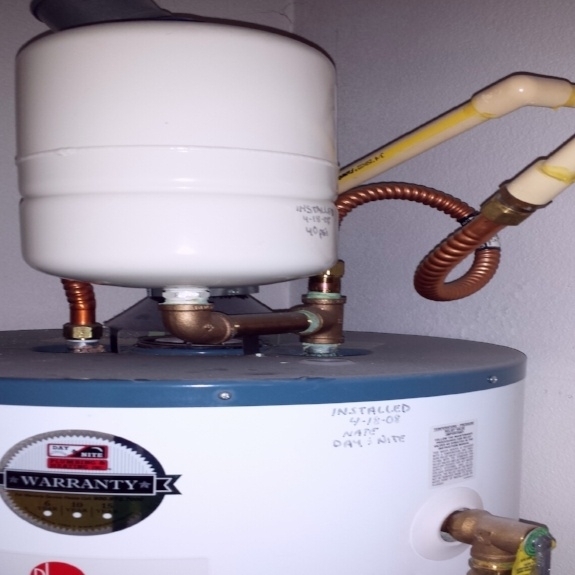 If you have any questions about your thermal expansion tank, or if you’re having to replace a water heater tank every few years or so and don’t know why it might be you don’t have a thermal expansion tank and need one. Give us a call, and we will come out and take care of that for you. Call us at King Plumbing, Heating, & A/C if you need plumbing installation, plumbing repairs, rooter services, shower or tub installation, an indoor or outdoor gas line or appliance installation in the Phoenix Valley area at 480-907-0226.